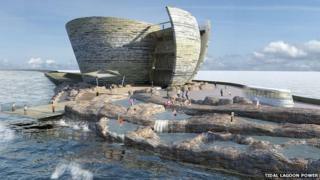 New plans are out for the world's first lagoon power plants, to be built here in the UK. 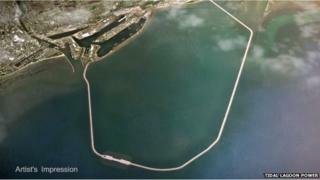 The gigantic lagoons - like big man-made lakes - would generate electricity using the power of the sea's tides. There are plans for six lagoons in total - four in Wales, one in the south-west of England in Somerset, and one in the north-west of England in Cumbria. The lagoons could generate 8% of the UK's electricity, say engineers. How does lagoon power work? The seas around Britain are tidal: this means the water levels rise and fall every day, sometimes by several metres in height. A turbine is a way of generating electricity from a turning fan. When wind, or water, rushes through the fan blades, it turns the turbine and generates power. This means a huge amount of water comes and goes, roughly twice a day. These special lagoons will use the power of the sea tides by controlling when the water flows back and forth. When the tide starts to rise, gates in the sea wall around the lagoon are closed and water builds up outside the wall. 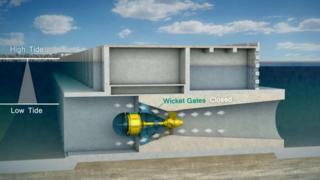 When the tide is at its highest, the gates are opened and the water rushes through turbines in the wall. As the turbines turn around, electricity is generated, and as the water passes through, the lagoon fills up as well. Then it happens the other way around: as the tide falls outside the wall, the level of the lagoon stays high. At low tide, the gates open again letting the water out of the lagoon, generating more electricity. It's thought the turbines would generate power in this way for an average of 14 hours each day. Environment groups say the lagoon shouldn't disturb wildlife too much and that it'll make much-needed clean energy. But some people are worried that the turbines might harm fish, so they don't want the lagoons built too close to rivers. The company behind the scheme say the lagoon walls would act as artificial reefs for wildlife.